“Who does wear them?” my friend Jemma asked. “Yes.” she bluntly replied. “My nephew is an absolute terror. He's rude and lazy and I'm resorting to petticoating.” she explained. Naturally, I asked what petticoating was... although I had a half decent idea. 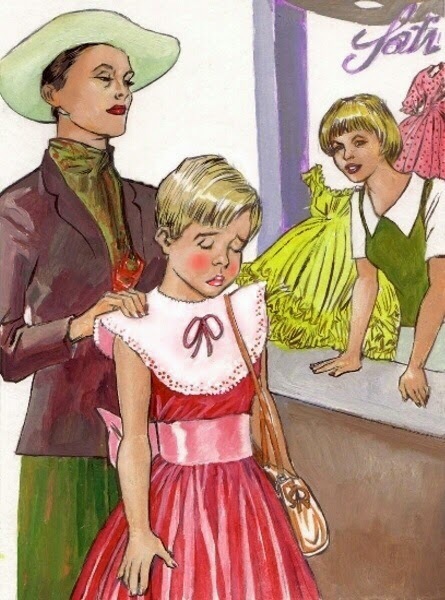 “Putting naughty boys in prissy dresses until they learn to behave themselves.” she replied. I couldn't help but giggle. “Well this is certainly prissy.” I said as I folded the dress neatly before putting it in a carrier bag. “Have a good day.” I said as I handed her the carrier bag. “I hope he likes it.” I added. “I'm banking on him hating it.” the lady said as a wry smile swept her face. I couldn't wait to tell Jemma about this particular sale and she couldn't believe it either. “Surely she was joking!” Jemma insisted as we walked to school the following Monday. “Sometimes Debs, you're so gullible.” she added. We both giggled at the idea of boys being forced to wear dresses... the bullies, the boisterous, the disruptive... but maybe Jemma was right. Maybe I am too gullible and the lady was teasing me. However the following Saturday as I manned the stall... I noticed a familiar frock amongst the crowd of shoppers. Next to this was a familiar stern face... the same stern face I'd sold the dress to a week earlier. I looked at the dress again and almost baulked at it's horrendous style, and then at the head above its broad round collar. At first I was still trying to deny the obvious. “Lots of girls have short hair.” I thought as the two figures sauntered up the high street. As they got a little closer, I spied lipstick and blusher painted on the most miserable face... and as they got closer still, it was clear that it was in fact a boy wearing what was possibly the most horrendous dress I'd ever sold. As they passed, the lady stopped. She turned the boy towards the stall and said, “This is the nice young lady who sold me your dress Peter.” I lied and said he looked very nice. The lady told the boy to say thank you, before insisting he curtsey for me. I wanted to burst out laughing, but he looked so humiliated, so ashamed, I simply cast him a supportive smile. The lady told me that 'hopefully', he won't need another dress. “But if he does, we'll be back.” she added. “I certainly hope so.” I replied, not knowing what else to say. The poor boy's head hung low and he barely gave me or anybody else any eye contact. The lady turned him away and they continued slowly along the high street. It was clear that he was being paraded and shamed. Heads turned. Fingers pointed. Children laughed and giggled. Adults talked in hushed tones, glancing at the boy in the horrendous dress. I couldn't wait to tell Jemma about it and telephoned her as soon as my day's work was finished. As we walked to school the following Monday, all she wanted to ask me about was the boy in the dress and I was more than happy to describe every last detail... from the lipstick, blusher and the look of shame on his face, right down to his lace trimmed white ankle socks and black Mary Jane's on his feet, in which he uncomfortably yet carefully walked. When we got to our form room, the teacher prepared to call out the register, but first, drew our attention to the new boy in class. “This is Peter Jackson... please make him feel welcome.” the teacher said as the boy glanced around the rest of the class. He smiled and said hello... but when his eyes met mine, he froze. The colour drained from his face just as quickly as his jaw dropped. More than anything I wanted to nudge Jemma and whisper 'that's him! ', but I chose not to. His first day at a new school must be nerve racking enough without me stirring things up. Brilliant, brilliant and double brilliant. I loved the twist at the end, and I've a feeling it'll become too much for you and I wouldn't mind betting the class will be in on what you and they don't know by the end of the day. glad you enjoyed it. I like writing the short ones that come in an hour or two after seeing an image and thinking "what's going on there?" big thanks to whoever the artist is. I would love a sequel that told Peters point of view. What a lovely story with a brilliant twist! I loved the fact that you chose the girl’s pov and liked the description of her excitement and fascination at seeing a petticoated boy… there’s no doubt she’ll be all over him at school. There should have been a part two to this story. Peter maybe hooking up with the girl from the store and she completes his feminization.